Smoke continues to invade the Jefferson River valley, but the smoke also aids anglers in pursing trout. 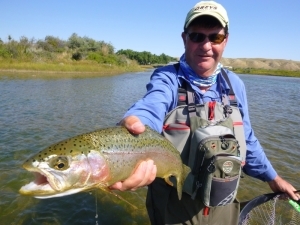 The Jefferson is on Hoot Owl restrictions with fishing permitted from 2:00 a.m. to 2:00 p.m. The best fishing is in the early morning with Tricos coming off. Again, the smoke creates great cover and fish can be seen feeding aggressively. Compra-duns, Purple Hazes, and Parachute Tricos in size 18, are perfect. Embrace 15 ft leaders to assist with fly line drag. If you are from France (as is our friend Christain, pictured), embrace 20 foot leaders. After the Trico’s, put on a Chubby, either purple or pink, about a size 8 with a #14 beaded hare’s ear. Never leave home without a BHC (Big Hole Crawler) in sizes 8-10. BHC is one of our favorite flies.